The second of Big Finish’s trilogy of double-bill releases begins with a tale that is something of a double bill in itself. That’s because Vortex Ice benefits from being heard a second time in light of revelations made during the course of the adventure. Jonathan Morris’s story revolves around one of the perils of time travel – being caught up in events that are already part of recorded history. Following a mining disaster, the Doctor (Colin Baker) and Flip (Lisa Greenwood) find duplicate versions of themselves frozen in temporal ice. This must have occurred in their own near future, and because they have now seen that future with their own eyes, their fate is inescapable. Or so it seems… I wouldn’t have given that much away unless it wasn’t really as simple as that. The plot thickens considerably during the second half of this two-part tale. Curiously, there is no shorting out of the time differential when two Flips meet each other, though in other respects the writer adheres to the known laws and limitations of time travel in Doctor Who. Unfortunately, both stories on this double CD are blighted by rather underwhelming half-time cliffhangers. It’s as though the actors involved (Greenwood and Baker respectively) did not know that it was to be the end of an episode and so failed to ramp up their performances accordingly. Could it be that these dramas were planned as single, hour-long episodes, only to be split into two parts retrospectively? The end of the first episode of Vortex Ice in particular contains what should be a game-changing reveal, but I overlooked the importance of it because it was so underplayed. This is another aspect of Vortex Ice that improves with a second listen, so that it doesn’t leave you cold. Composer Joe Kraemer evokes the general period during which Colin Baker starred in the television series, with music that at times sounds remarkably like the work of the BBC Radiophonic Workshop’s Roger Limb – though sometimes he pitches it a bit too ‘recent’, with cues that bring to mind Mark Ayres or even John Debney. Surprisingly, Kraemer reuses the same themes during both adventures, rather than seeking to vary his scores. You can hear a 16-minute suite of his music at the end of Disc One. 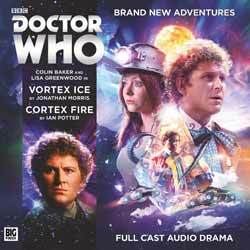 Unlike the previous release, there is no direct narrative link between the two stories on this double CD, except insofar as they both concern the same Doctor and companion team. However, there are some interesting thematic contrasts. Aside from the obvious differences between fire and ice, Cortex Fire is set in a far future, alien setting, as opposed to the Earthbound present day of Vortex Ice. Events take place very much ‘up above’, with tall buildings, flying cars and auroras in the sky, rather than ‘down below’ in a deep, dark mine. Both stories deal with predestination, but of very different kinds. The central question of Ian Potter’s plot is what is causing the nihilist ‘attacks’ upon the city of Festin. The topical subject of terrorists and in particular suicide bombers is brought to mind as the afflicted self-ignite. Festin’s investigators wonder whether there is a pattern to the nihilists’ behaviour – is there some cultural or biological trait that predisposes them to such actions? However, it is made very clear to the listener from an early stage that these people don’t become nihilists by choice – not by conscious choice, anyway. As the plot unfolds, the notion of a meme, a shared subconscious idea, comes to the fore. The nature of the threat keeps changing as the Doctor and his allies learn more about it. One could argue that it changes too much and too often, and that Potter’s idea loses some of its clarity along the way. The performances are mixed. Eve Webster is very good, channelling the Mondasian Cybermen with her discordant delivery of the voice of the computerised Cortex. Simon Kane (of John Finnemore’s Souvenir Programme) is sometimes a little stilted as Halus. Even more so is Youssef Kerkour as Dakeem, whose laugh of realisation towards the end of the story sounds very false. All in all, Cortex Fire doesn’t quite set the world (or my cortex) alight.